2014 is here and with it opens a new year full of many opportunities to test. We are presented with a clean slate. Any missed opportunities or “we should’ve tested that” are in the past. This post will help you with the basic steps to learn how to approach testing in order to test smarter, not harder, when setting up your tests in 2014. Every test begins with an idea on how to make a webpage or email better by deciding the key performance indicators (KPI). In other words, what are we trying to learn from the test? Are we trying to increase clickthrough rate to another page in the funnel? Are we trying to increase the conversion rate on a product page? Are we trying to determine user motivation by changing the value proposition? Setting a clear objective for your key performance indicators in the beginning helps to focus on the main learning of the test. For example, if you change the copy of the call-to-action (CTA) in one treatment versus the control, your key performance indicator is clickthrough rate. Your change of the copy on the CTA button might affect clickthrough rate. It is important to have a clear understanding of what you are trying to learn from your test based on the key performance indicators you have developed. It is easy to lose sight of this once the data starts coming in, but this is the basis of the test so stay focused on what you are trying to learn. Once you have your key performance indicators, get a group of people together to strategize. Strategy sessions give you the opportunity to bring ideas to the table, but more importantly, the brainstorming with others helps keep your test plans on track. People who are not as familiar with your project offer the advantage of seeing these webpages or emails for the first time and can point out parts that may have been overlooked, or offer a different perspective. In the end it is worth it to take the time for collaboration to build a better test – a foundation that can, and hopefully will, make all the difference when the results start coming in. Step #3. Win or lose, learn something! The results make all the hard work and thought put into building a test worth it. This is the point in the process when you sit back and watch the data. Like a sporting event, you are rooting for your treatment to outperform the control. When your treatment achieves a lift over the control, it feels just like your team scored a touchdown – except better, because you’re the one on the marketing field running the ball in for the score. It is important to remember that even if your treatment(s) did not win during the test, there are still valuable lessons to be learned. You should always dig into the results and walk away with some type of learning, even if it is not what you originally intended to learn from the test. Win or lose, there is always a learning behind the results. Personally, I think it is important to really enjoy the testing process from the beginning to the end. In order to test smarter, it helps to be passionate about learning and improving. Marketing Metrics: Can you have one number to rule them all? Great tips. 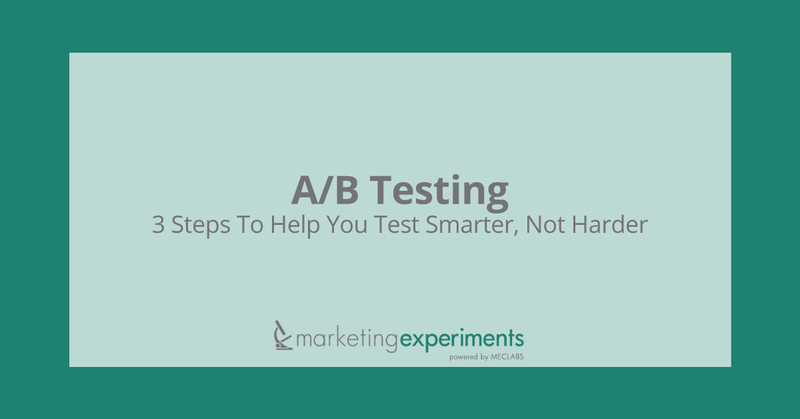 I wanted to ask if you had any software that you would recommend for A/B tests. Maybe something that can help to easily move objects, launch the new design and then track?